Teachers at my school, fellow ETAs, even taxi drivers insisted that I experience the wedding ceremony that is so unique to Indonesia, and especially, it seems, to the island of Java. The idea of just popping into someone’s wedding for the sake of a “cultural experience” made me a little uncomfortable. 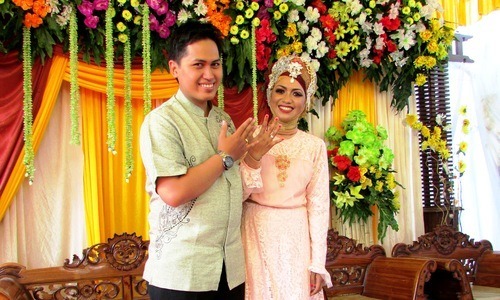 Though I was told that the Javanese tend to embrace a “the more the merrier” attitude for weddings, any experience that I had had with weddings in the United States—which, to be fair, was pretty limited—told me that marriages are too personal for random guests. I worried far more than I should have about how I would navigate the experience, if and when it would arrive. 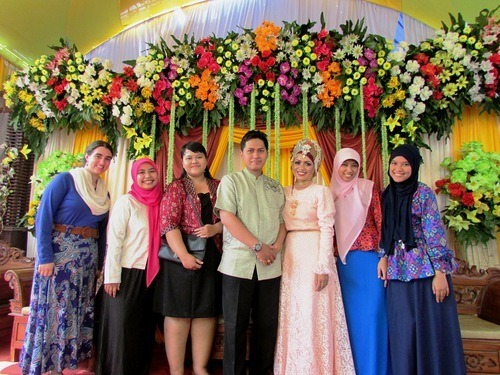 Fortunately, when I was eventually handed my first elaborate invitation to a Javanese wedding, it was from one of the math teachers who had helped make me feel so welcome here in my first few weeks, and I was happy to go. I did not attend the wedding itself—those who accompanied me there informed me this was usually limited to family and very close friends—but rather the reception afterwards. A bright yellow tent marked the location of the festivities, and English love ballads blared from a tower of speakers I was not entirely sure was stable. Flowers in every hue draped gracefully above a raised platform where guests posed for photos with the bride and groom, food prepared by the bride’s family was plentiful and delicious, and everyone was dressed in the bright colors I have come to associate with this country. I was told that the bride was no longer wearing “the real dress,” but there was no denying that even her attire for the reception was the kind of beautiful I’m more accustomed to seeing behind museum glass than in real life. Perhaps the most memorable part of attending this wedding was how happy the bride and groom were: love outshines every other form of beauty, even here. The wedding reception was in the town where the bride and groom were raised, a five hour van ride through mountains, rice paddies, small villages, and larger cites whose names I could never seem to glean from the signs we passed. I attended with the rest of the math teachers, as well as our lovely Japanese teacher and an English teacher who used to teach at SMAN 10. They were a lively, lovely crew, and the long ride was filled with stories and jokes in both Indonesian and English, and even when they babbled a mile a minute in Javanese, a language I only know a handful of words in, just sitting and watching their animated faces and listening to their laughter quickly became one of my favorite car ride memories. I could not have asked for better company. Later that same weekend, my site mate’s counterpart took both my site mate and I to the wedding of one of her friend’s daughters. 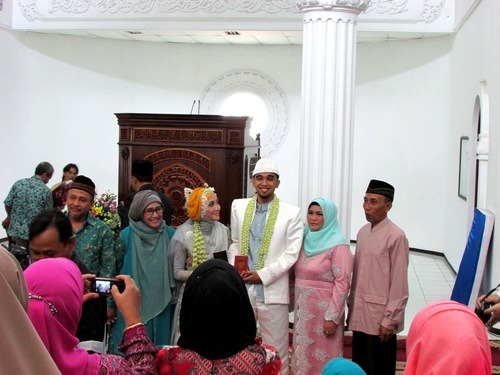 We attended the actual ceremony this time, or the pernikahan at an immense mosque on the campus of Universitas Muhammadiyah Malang, or U.M.M. I watched as the couple prayed and was prayed over, vows were exchanged, and marriage certificates were received. 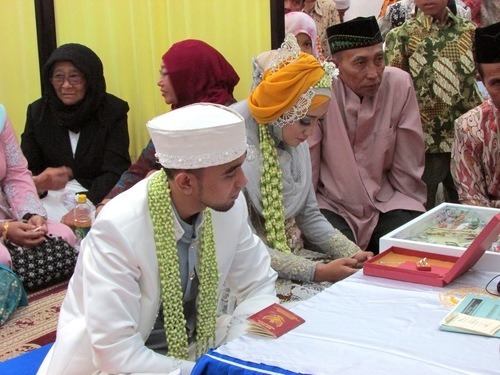 My limited Indonesian does not extend to wedding vernacular, but I was mostly able to keep up through a combination of whispered translations from my site mate—who was an ETA in Sumatra last year, and whose Indonesian far exceeds my own—and by watching the reactions of the other guests. In many ways, this wedding was precisely the experience I had feared: I was encouraged to step towards the front to take pictures, when I would have been perfectly content to stay in the back of the mosque and accept what photographs I could manage—I’m an ETA who would like to document some of her experiences, not a photojournalist—, and at the end of the ceremony I was brought to the couple and their families to extend my selamat (congratulations), though I had never met them before. More than once I felt awkward and wanted nothing more than to disappear into the carpet on which I kneeled, so that I could hide my uncovered head and foreign dress. 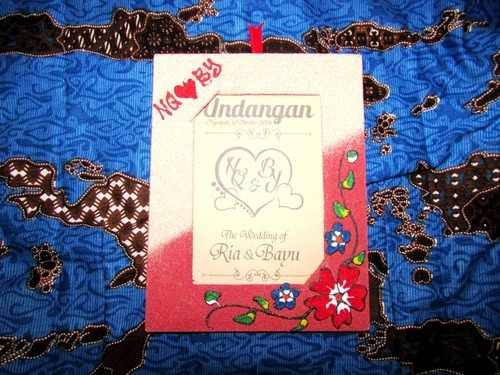 But in between those moments, I found myself truly enjoying the experience of learning about one more set of Indonesian traditions, and watching two people begin their lives together, though I did not know their language, or even their names. I could not stop myself from being surprised when a price for the bride was discussed and agreed to, and could not but adore the way both sets of parents prayed fervently over the new couple, blessing the new marriage. And at the end of the ceremony, when the putri dan putra (bride and groom) stood in front of the guests and smiled wider than the ocean that separates me from my home, I smiled too. It has been quite a while since I have attended a wedding in any culture; the last time I watched two people exchange vows, I was more concerned with whether or not my cousins would play tag with me later than any promises of love. These weddings were not only my first Indonesian weddings, but they were also my first weddings as an adult, able to fully appreciate what I was witnessing. And though I may have been sporadically uncomfortable and not understand most of what was said at either wedding experience, I could understand the happiness that surrounded the occasion. The weddings I will eventually attend back home may not be as colorful as the weddings I saw here, but I can only hope that the overall feeling of love will permeate those events in the same way. This entry was posted in Uncategorized and tagged Indonesia, java, Javanese Traditions, Javanese Weddings, travel, travel blog, Weddings. Bookmark the permalink.